Home / QuiBidder of the Week – Catherine G.
QuiBidder of the Week – Catherine G.
Congratulations to our newest QuiBidder of the Week, Catherine G.! 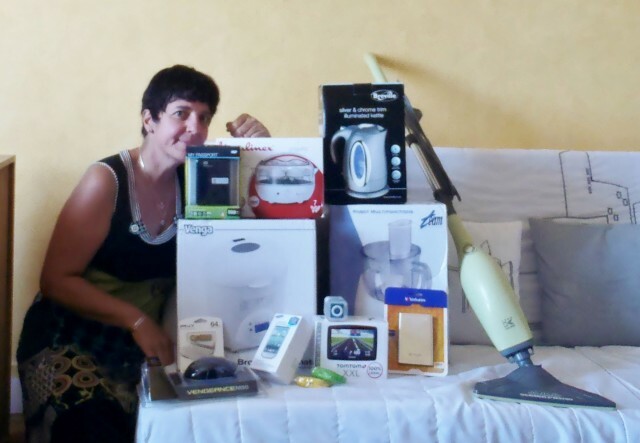 Catherine is our first French customer to win QuiBidder of the Week. Continue reading to learn more about her experiences on QuiBids, and be sure to tell her congratulations, or félicitations, in the comments below. Click here if you want to share your QuiBids experiences (along with a photo of you and your winnings) so you can become the next QuiBidder of the Week. If your story is chosen to be featured on our blog, you’ll receive a Free $50 gift card of your choice! Congrats again Catherine for being named QuiBidder of the Week! Enjoy your $50 gift card! Click here to share your QuiBids Story and photo and you could win a $50 Gift Card by being the next QuiBidder of the Week!